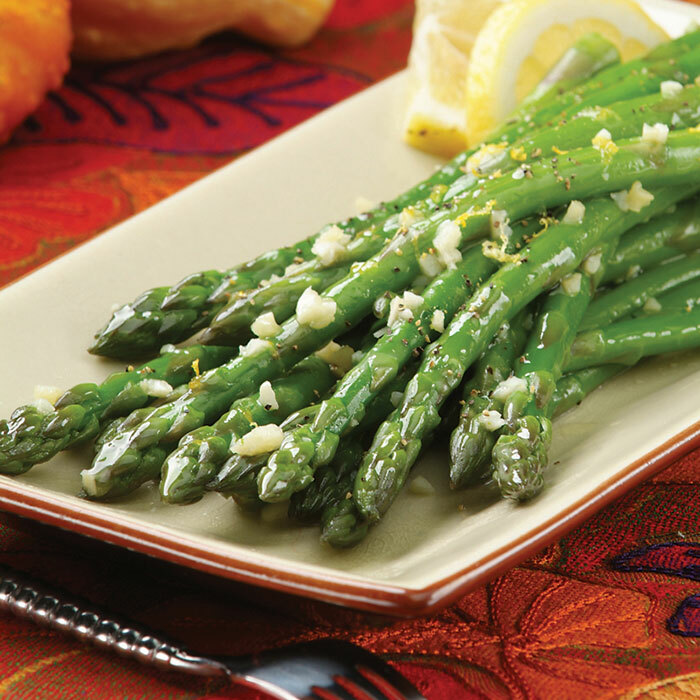 This beautiful asparagus side dish will add color and flavor to your favorite meal! Heat large covered saucepot of salted water to boiling over high heat. Add 1/3 of the asparagus to water and cook 1 minute. With tongs, immediately transfer asparagus to large bowl filled with ice water. Once cooled, drain asparagus. Repeat process 2 times, returning water to boiling before adding asparagus. In large skillet, heat 2 tablespoons oil and 1 teaspoon butter over medium-high heat. Add 1/3 of the asparagus and cook 3 to 5 minutes or until asparagus is tender-crisp and heated through, stirring frequently. Transfer asparagus to large bowl; keep warm. Repeat process 2 times. Toss asparagus with lemon zest, salt and pepper. Place asparagus on large serving platter and garnish with lemon slices, if desired.